The Harley-Davidson Street Glide defines the state-of-the-art in stripped down bagger style. Only Harley-Davidson could pull off a machine like this. They started by stripping off parts, moved on to slamming the suspension, then dialed up the comfort. The end result: a bike that goes from 4-lane super slab to neon drenched strip and never misses a beat. 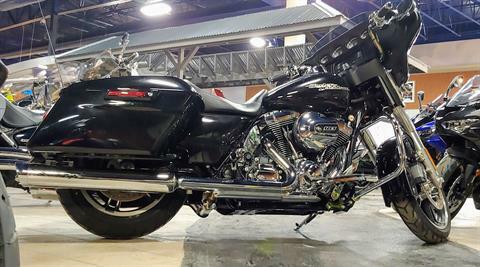 This boulevard bruiser is ideal for all lengths of travel. Wanna cruise down to your local biker bar? The Street Glide can do that! Need to go pick up groceries for dinner tonight? The Street Glide can also do that! Planning a journey through the mountains? The Street Glide's down for that! No matter how far (or close) you go, the Street Glide's High Output Twin Cam 103 engine is specially designed for the trip! Come on in to Full Throttle Motorsports today to check it out!